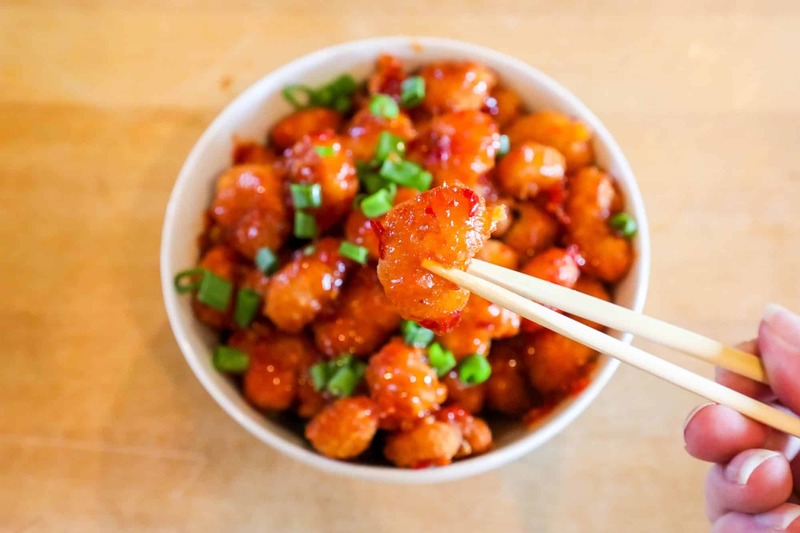 Sriracha Honey Sweet Chili Popcorn Shrimp is sweet, spicy, and super delicious! Great over salads, in tacos, or served with rice! This post is sponsored by SeaPak, all opinions are my own! 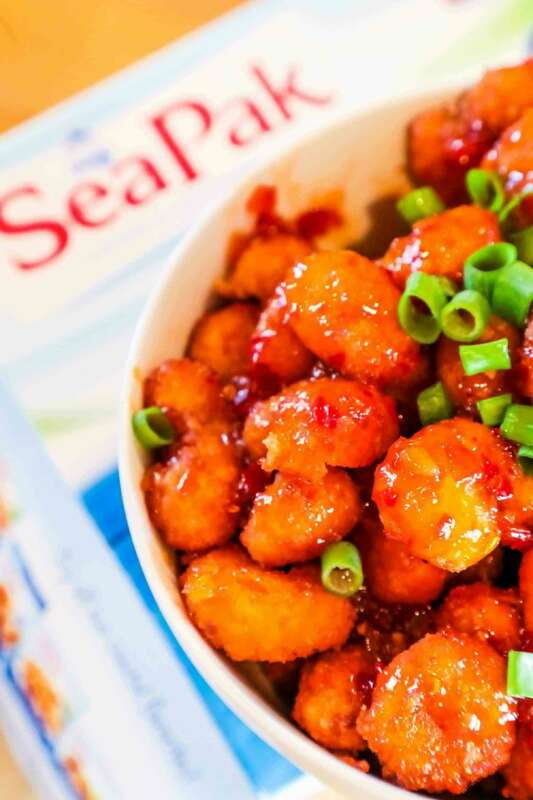 I love to share products from brands I love and use in my home – and we’ve long been fans of SeaPak and their delicious, easy frozen seafood! 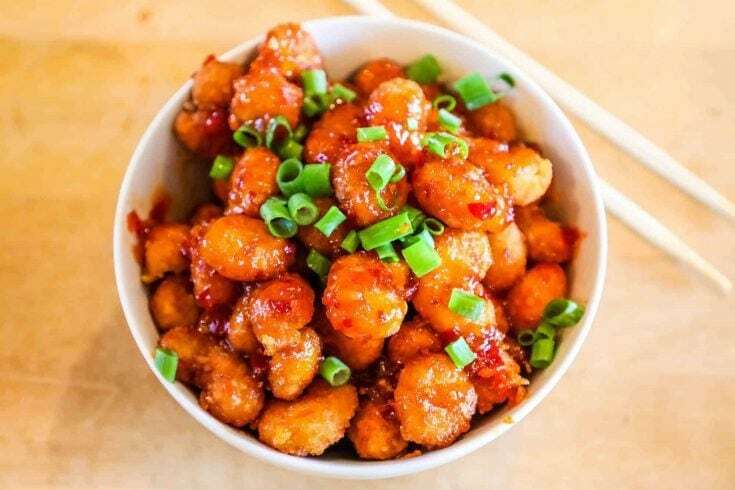 Popcorn shrimp is one of my absolute favorite meals of all time – it is slightly sweet, salty, and full of flavor – plus the crunchy breading really makes a shrimp’s flavor extra buttery and indulgent. This popcorn shrimp is a sweet and spicy twist on the classic – and couldn’t be easier to make. 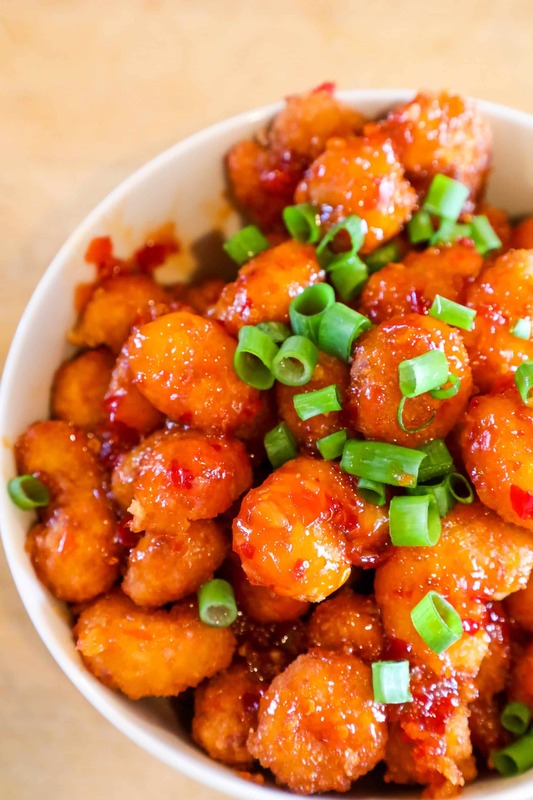 While sriracha is spicy, the gentle heat of the sweet chili, mixed with the honey, makes this dish really pop and not blow out your palate. It’s fantastic over a salad, paired with rice, or even in a taco or burrito! This makes a fabulous addition to a build-your-own salad or taco bar for summer entertaining, too – the red sauce really pops and looks as pretty as it is delicious! I like to top mine with a bit of green onions to really make the red bright and stand out. In a small bowl, mix garlic, sweet chili, honey, and sriracha well. Add frozen shrimp to a large bowl, toss with cornstarch. Spread popcorn shrimp onto baking sheet. Drizzle with 3/4 sauce mixture, toss to coat. Bake for 25 minutes, until shrimp is hot and cooked through. Drizzle remaining sauce on shrimp, top with green onions. 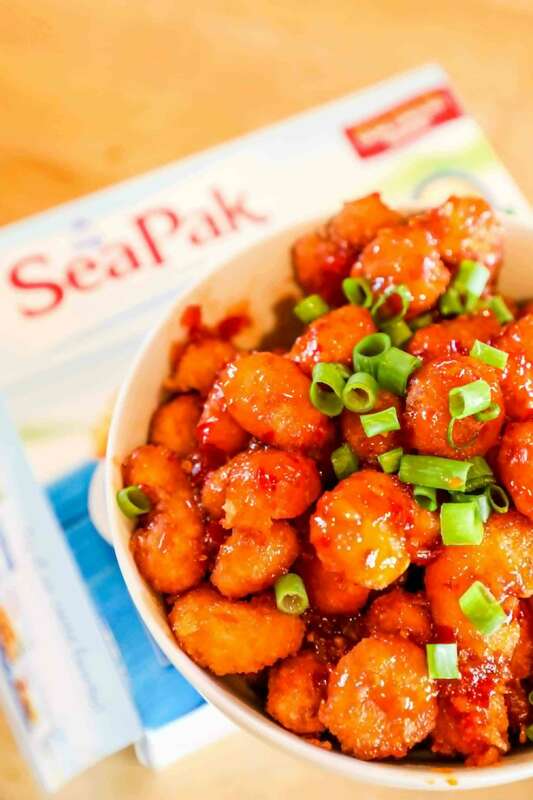 If you’d like to learn more about SeaPak and how they make flavorful, frozen fresh dinners easy, please sign up for SeaPak’s Coastal Catch E-Newsletter Sign-up and visit their site: https://www.seapak.com/ and find their products here. Also be sure to visit their facebook and instagram pages! Our family loves SeaPak because we try to switch shrimp and seafood out for meat more often – but living in Colorado can be a bit tricky for fresh fish that fits our family’s budget. I love incorporating fresh-frozen products in our diet, and my kids go WILD for all of SeaPak’s breaded shrimp! My fault! I used another brand of popcorn shrimp that has to cook for 25 minutes! SeaPak only cooks for 10!! I’m buying SeaPak next time! Forgot to say that I did pour 3/4 of the sauce over them before starting to bake. Didn’t want anyone to think I didn’t read the directions! lol. Uh, oh! I did something majorly wrong! The flavors are delicious and I can see this on popcorn chicken, too. I lined my sheet with foil and sprayed it with cooking spray. I tossed the shrimp coated in cornstarch on there and baked it at the degree suggested on the box (425 degrees). I tried to move them around a little at the half-way point, but when they weren’t budging, I let them alone. I kept watching them for signs of doneness but the sauce was starting to get pretty dark. I shortened the cooking time by 7 minutes. I poured the extra sauce over the shrimp but the sauce had pretty much burned on the pan. I peeled off the shrimp and lost about 25% of them to the sauce turning a hard, crispy black. So, I am going to make this again next week because the sauce is so good you could almost eat it with a spoon! I’ll ignore the box directions, turn the oven down and try it again. 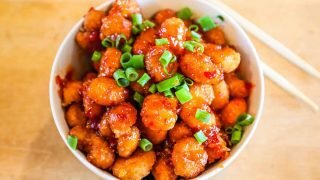 Thank you so much for sharing this unique and delicious…and did I say so easy way to use frozen popcorn shrimp! Amazing and yummy! We love their popcorn shrimp! The flavors on this are genius! Love it ! Just love it ! Thank you ! 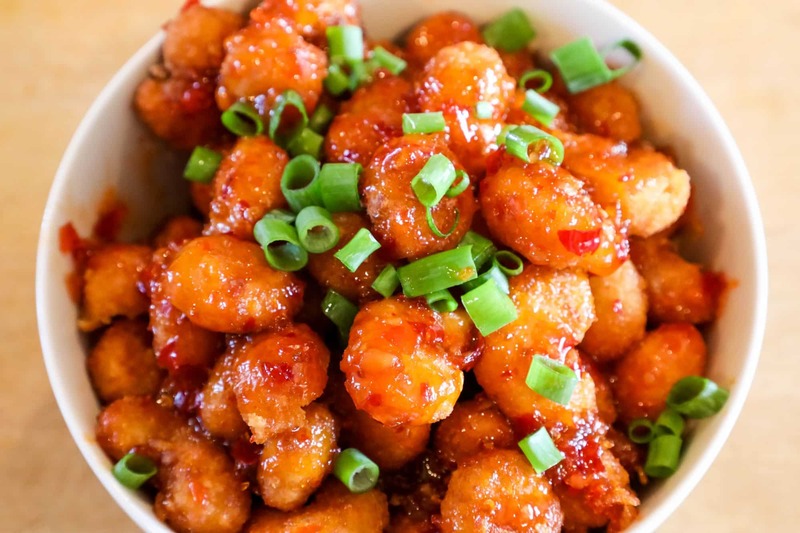 Popcorn shrimp is always SUCH a winner! And that spicy sweet goodness? DIGGING IT! I bet this is SO addicting!!! !